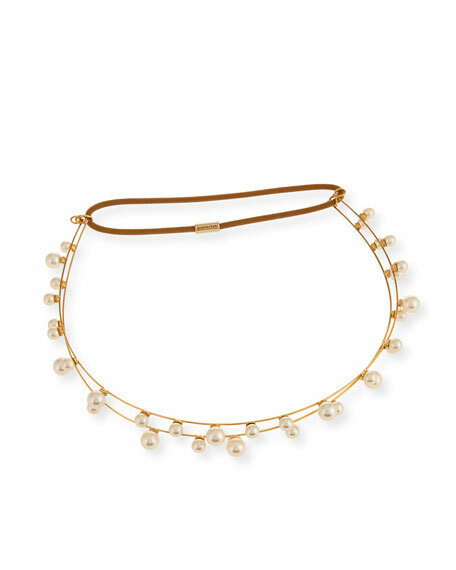 Jennifer Behr "Sybil" bandeau headband. Two rows of simulated Swarovski® crystal pearls. Elastic back for comfortable fit. Handmade in USA of imported material. Ancient signifiers of royalty and ceremony, headpieces have a rich and fascinating history. Inspired by this talismanic power, Jennifer Behr creates the most luxurious headpieces on the market today. Each heirloom-quality piece is painstakingly made by hand in NYC. Hand-cut silk flowers and prong-set Swarovski® crystals adorn a range of stylesincluding headbands, bobby pins, fascinators, and hats. After all, special events require exceptional styleturn to Jennifer Behr accessories to complete your gala, wedding, or party look. For in-store inquiries, use sku #2404747.